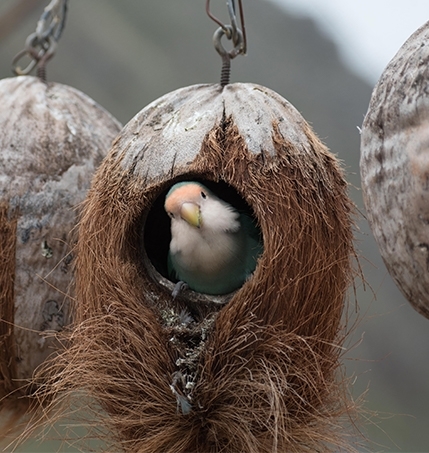 In our last blog we detailed the small changes we were making within the company to limit our impact on the environment, and we received such a good response from our customers, that we've chosen to feature their emails below, to share their stories with you. Thank you for sending them in, we always love to hear from you. "I used my boxes from you to put Christmas gifts in (the small, difficult shaped things) so had sturdy boxes to wrap and decorate. I am now using the boxes to store the rose petals that I am drying as confetti for my daughters wedding in October (from the roses that are brightening up my house)" - Sue W.
"Thank you, I bought a bag of offcuts before I had an operation on my foot and have lined my orthopaedic shoe with the bits. Toasty foot healing nicely!" - Primrose Y. Buying quality items, long term, is so much cheaper in every respect than the short-sighted, ‘disposable’ approach. Here we also ‘recycle’ Celtic and woollens in general: I keep all the wool from the de-pilling of my wool items and leave the wool fluff out on the table in the garden. The birds appreciate, it all goes very quickly, and I smile imagining their little nests lined with lambswool, merino etc. All the best" - Isabelle S.
We recently lent one of our industrial sewing machines to a local school who were starting up a fantastic innovative way of recycling pre-loved wetsuits. 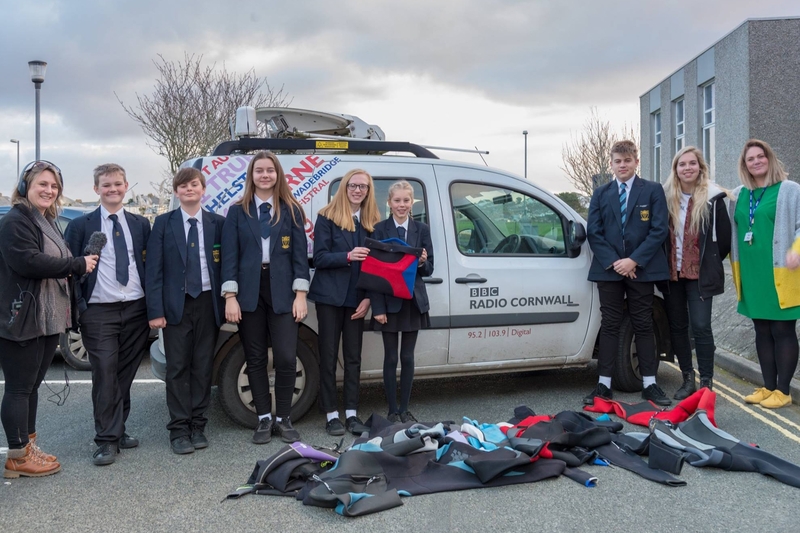 Enterprising Newquay Tretherras Year 9 students have been working on turning discarded wetsuits into book bags for primary school children. 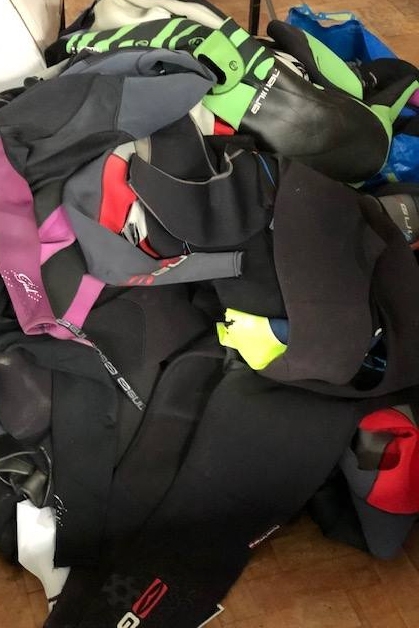 As part of the Young Enterprise competition, so far the students have collected donated wetsuits from the public and local businesses, and have been busy cutting and sewing the materials to make book bags, bottle cozies and cup holders as well and developing innovative new products. Check out their Facebook page - Seal Book Bags and follow their progress with finding a way to re-use these old wetsuits that would've had a massive impact on our environment if incinerated or put into landfill. Lyndsey from Escape Surf School in Newquay pictured here (in her Celtic & Co Wilderness Boots actually!) making a wetsuit donation. 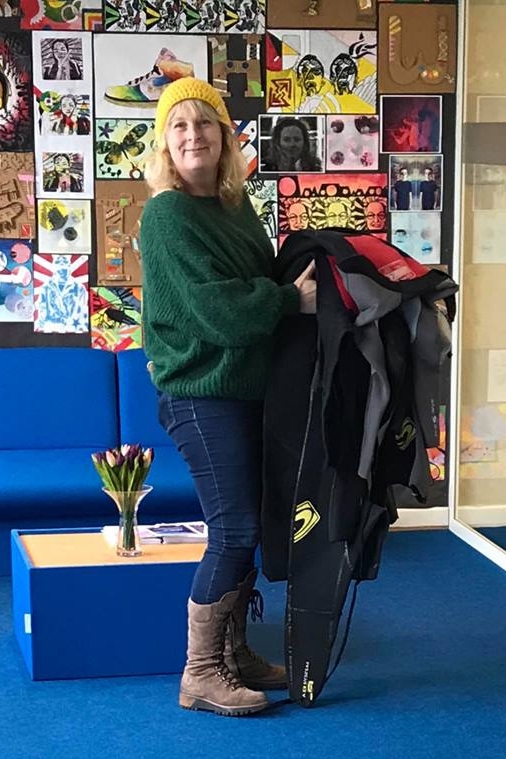 Staff at Newquay Tretherras School are inviting individuals and company's to donate their old disused wetsuits for this project. Want to donate? Visit their Facebook page today. Have some questions about our sustainable efforts or suggestions about how we can become a greener brand? Then please get in touch as we'd love to hear from you!